As you may have heard, the EU is rolling out its new General Data Protection Regulation (GDPR) next month, in an effort to regulate the collection, processing, and use of personal data for all EU citizens. The new legislation is widely considered to be the most inclusive and restrictive set of data driven fan experience handling regulations to date, and it will have an immediate impact on sports marketers who operate in the EU or market to EU citizens abroad. As US-based sports marketing companies begin re-shaping their data handling procedures to comply with GDPR, there is a fair amount of speculation that similar legislation from the United States Congress will follow closely behind. At TGSM, we’re keeping a close eye on ongoing developments on both sides of the Atlantic – and we’re very excited to see the future landscape of data-driven marketing coming into focus worldwide. Collecting and processing data is a huge part of the personalized fan experience that TGSM provides to fans. The exchange of data begins the moment a fan connects to our free high-speed Wi-Fi signal or steps inside our interactive luxury restroom trailer. At every step of the experience, we collect anonymous data about fans’ reactions to various advertising messages and interactive displays, and their physical movement through our activation. And at several points in the process, fans are given the opportunity to consensually provide additional personal data such as their email address, social profiles, and mobile device data to enhance their personalized fan experience. At this point in time, we don’t see GDPR as a particular threat or risk to our business operations. From the very beginning, we have designed our strategy with an emphasis on fair and compliant data handling protocols. With a few minor adjustments, we will fully comply with GDPR – and we expect a similar process for any upcoming U.S. regulations. We do anticipate that GDPR will have some impact on the wider industry of sports marketing, which is currently settling in to its new focus on a data-driven fan experience. Here are three key effects that we are likely to see in response to the new EU regulations. GDPR compliance will require investment on the part of many companies that operate within the realm of sports marketing. And because of the hefty fines for GDPR violations – no company, in the EU or elsewhere, can afford to overlook these regulations. The biggest expense we anticipate is that compliance will require companies to hire staff. GDPR includes a requirement for data accessibility, which means that citizens have a right to review their personal data at any time; and a requirement for the right to be forgotten, which means that data must be deleted at the citizen’s request. These regulations won’t require major changes to existing data handling systems; but they will require staff to review and execute changes as requests are received from citizens. There may also be some indirect and delayed expenses associated with data encryption. 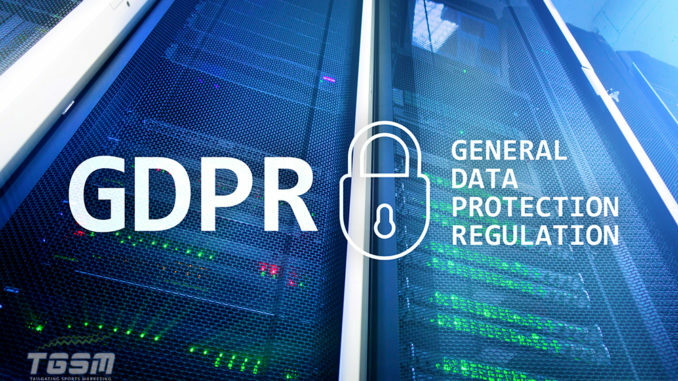 While data encryption is not directly mandated by GDPR, it is consistent with the general direction of the new regulations – and many companies will likely begin encrypting all personal data in order to demonstrate good faith and insulate themselves from fines and violations in the future. GDPR includes distinctions between the roles of data controllers and data processors. Any company that oversees the collection and architecture of personal data is considered a controller; while companies that only use data under the supervision of a controller are considered processors. Large organizations will likely find that they are controllers for some personal data points and processors for others, and those companies will need to comply with both sets of GDPR guidelines accordingly. Smaller companies are more likely to redefine their marketing procedures to keep themselves in the role of data processor as much as possible. Doing so will simplify their compliance efforts and limit their exposure to the risk of violations and fines. As many small companies limit themselves to the role of data processor, demand will be created for data controllers to step up and provide collection and architecture services for those smaller companies. While it has always been widely agreed that consent-based data collection is the best and most ethical practice, there is no question that some companies have taken liberties with the definition of consent. By setting opt-in checkboxes to “yes” as a default, some companies have worked around the intent of the opt-in setting and blurred the lines for what constitutes consent. While companies who have collected questionable data may need to do some retroactive data maintenance to comply with GDPR, this change should not present a major roadblock to the overall idea of a data-driven fan experience. To the contrary, we expect to see some very creative and original approaches to the problem; and we expect that fan experience will benefit as a result. As you probably know, data collection and data-driven marketing are key aspects of the success of TGSM’s personalized tailgating brand activation assets. We use consensual personal data to deliver a unique and exciting fan experience on the tailgating lot. Fans love our approach, and they have always been happy to provide some personal data to get the most out of the experience. We are currently working to ensure that every aspect of our assets is aligned with the new GDPR regulations, and we expect TGSM to be in full compliance well ahead of the enforcement date of May 25, 2018. We believe that responsible data management is an important responsibility for every player in the sports marketing arena. We’re excited to see the new landscape of the data-driven fan experience taking shape. And we will gladly do our part to ensure that the safety and security of the fans remains the highest priority as we move forward.